Allan Holtz at the excellent old comics blog The Stripper’s Guide posted an example the other day of The Wish Twins and Aladdin’s Lamp by W.O. Wilson, which inspired me to get this posted. Here’s an example I scanned from August 5th, 1906 of The Wish Twins and Aladdin’s Lamp by W.O. 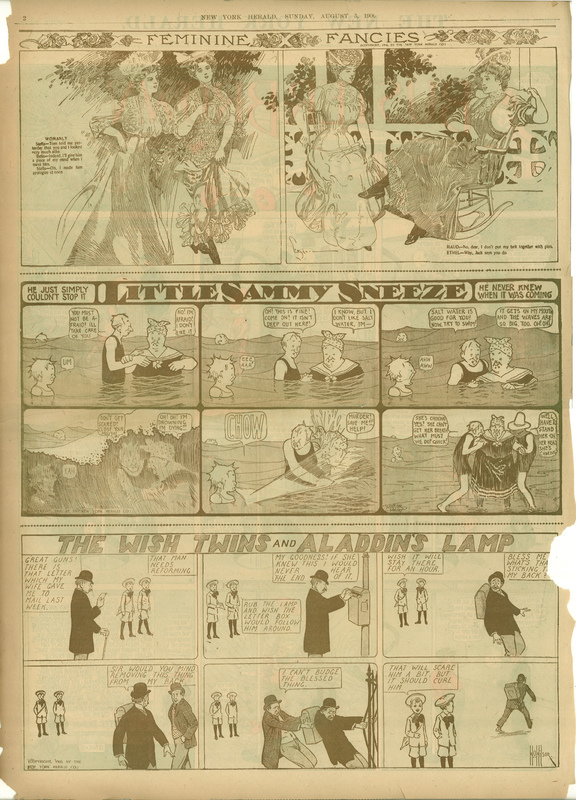 Wilson, along with Little Sammy Sneeze by Winsor McCay, and Feminine Fancies by unknown. If anyone out there knows the cartoonist who did Feminine Fancies (which I believe is the same series as Fancies of the Fair), please let me know… their signature is in the middle panel. Click here to read more examples of Little Sammy Sneeze at Barnacle Press. Click here to read more examples of The Wish Twins and Aladdin’s Lamp at Barnacle Press. See some stunning examples of W.O. Wilson’s Madge the Magician’s Daughter at Hogan’s Alley (which are also in black and white in the print edition of the magazine). Click here to read more examples of Fancies of the Fair at Barnacle Press. 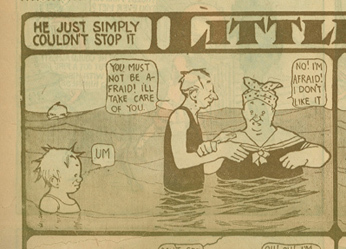 Click here to read about Winsor McCay at lambiek.net. Click here to read about W.O. Wilson at lambiek.net. It appears someone recently published a small book collection of Madge the Magician’s Daughter. There are too many McCay books for me to reference here… we live in wondrous times. Here is a link to the amazing McCay books from Sunday Press printed and restored at full size… big enough to be used as a blunt object. They recently did a Little Sammy Sneeze book that oh boy I gotta have someday, which also includes a lot of examples of two other marvelous strips that were printed on the backs of the Sammy Sneeze strips… The Upside-Downs by Gustave Verbeek and J.P. Benson’s Woozlebeasts.